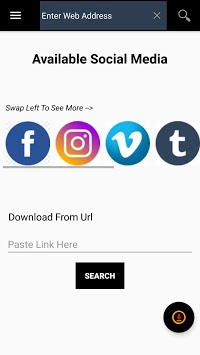 DOWNLOAD Latest HD video downloader free allows you to download latest 4K videos and social media clips from social webs and You can download any type of videos with a faster speed.Any video download is the functionality of this app. All 4K Video Downloader specially designed for videos and clips fee downloader , it is very easy for all users. on single tap you can download video and You can find it in the storage tab which is in the navigational drawer. A powerful video ultra HD downloader for social media allows you to download freely all formats videos frominternet.you install this super fast video downloader and get link from website and past into the downloader application and download dialog will appear on your screen.you can download multiple videos at a time and its working quickly.this application have a quick response feature of hd video downloading and extra fast 4k video downloading features. Download and rate this app so it can reach maximum users. All 4K Video Downloader & Fast Downloading Manager is a powerful and quick video app to download ultra hd videos and other files from FTP links. Just tap single and download videos.fast download and play it offline.super powerful download video manager allows you to pause and resume files. Note: Download video from YOUTUBE is not allowed due to its term and conditions. According to the Instagram or Facebook and other websites user copyright , you need to get the permission from the owner if you want to repost them.